Parish names always have a reason. Maybe it is for the patron saint of the founding pastor’s mother, or of a bishop or the Pope, or any one of the titles of the Blessed Virgin. Mary, Mother of the Redeemer in North Wales belongs to the latter category, but in a unique way. Founded in 1987, it takes the name of an encyclical, at least in the vernacular. It was that same year Pope John Paul II issued Redemptoris Mater, which addressed the role of Mary in salvation history. Father Philip C. Ricci was appointed pastor of the new parish on Sept. 9, 1987. 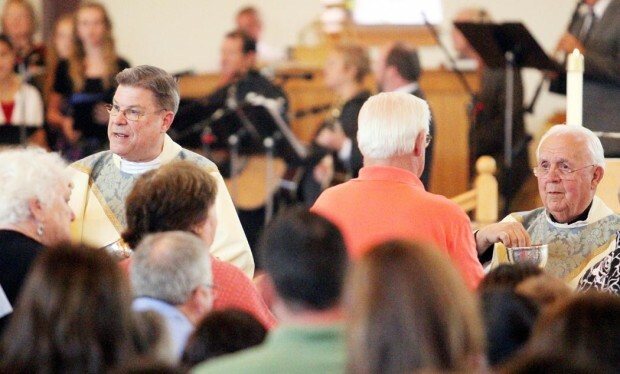 His first Masses were celebrated at the Neshaminy Falls Village Clubhouse for a congregation drawn from the 800 families who transferred from St. Stanislaus, Lansdale. 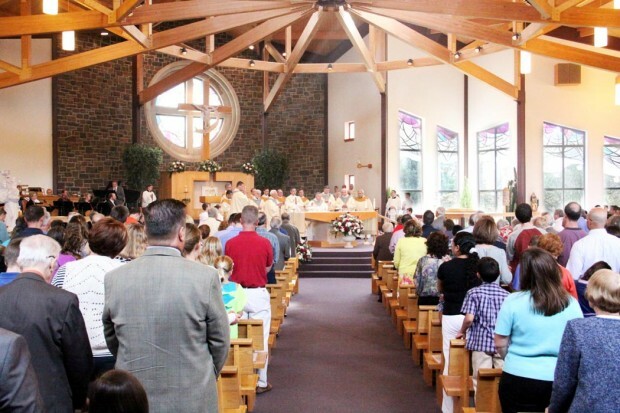 Later, Masses were held at Gwynedd-Mercy College, and finally in October 1991, in the present church building. By 1997, registered families reached 2,484 with 725 children in the CCD program. Thanks to an $8.5 million capital campaign, a new Education Center was completed and a parochial school opened with Joanne Zinn as principal, later followed by Denise Judge. And in seven short years it would receive the designation “Blue Ribbon School of Excellence” from the U.S. Department of Education. In 2008, Father Ricci, by now Msgr. 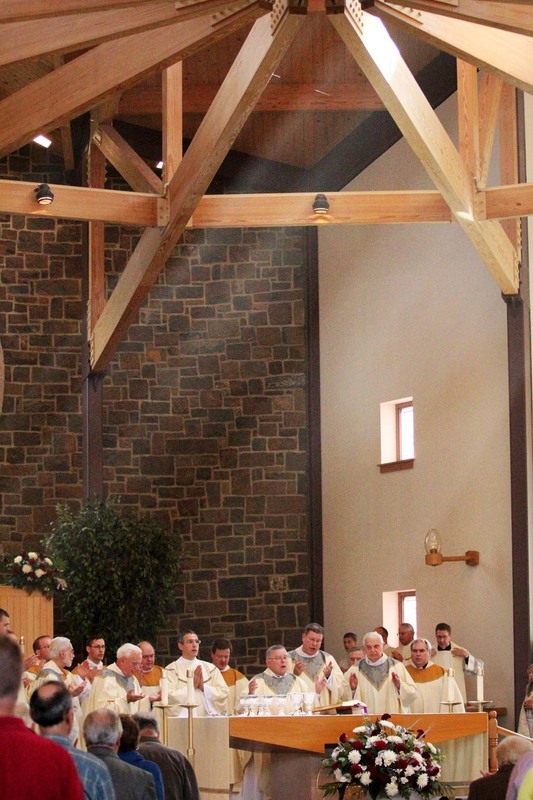 Ricci, retired after 23 faith-filled years of service and was named pastor emeritus and was succeeded by Msgr. John T. Conway. Chuck Colburn, who arrived in the parish shortly after the foundation and has witnessed the phenomenal growth, credits much of this to Msgr. Ricci. “I think a lot of people joined the parishes because of his personality,” he said. This has continued under Msgr. Conway, and most notably through the parish RCIA program, Colburn believes. “It seems to grow every year,” he said. On the other hand Laura DiBiagio and her husband arrived just nine years ago, with their children just about grown. They had been active in their previous parish and wondered how they would fit in at MMR. Mary, Mother of the Redeemer, where Archbishop Charles J. Chaput celebrated the 25th anniversary Mass, now has more than 3,600 families and is among the 10 largest parishes in the entire Archdiocese of Philadelphia. Lou Baldwin is a freelance writer and member of St. Leo Parish, Philadelphia.